Ceiling mural inspired by Salvador Dali by Visionary Mural Co. 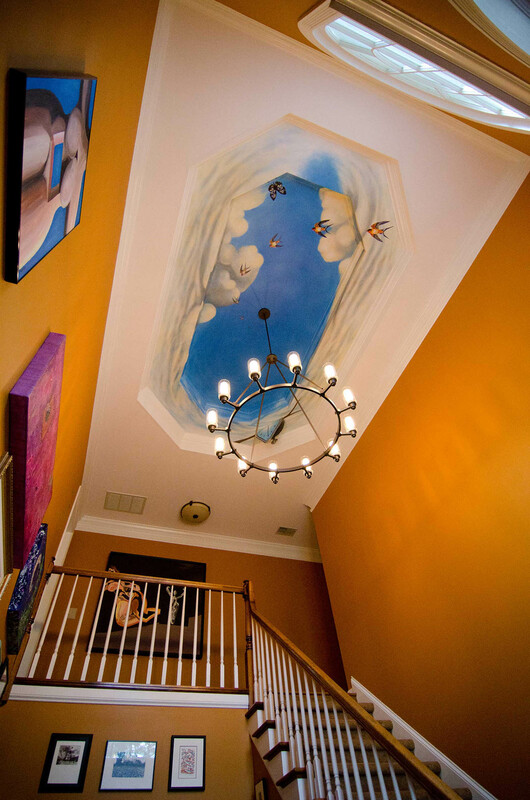 Her client’s favorite artist, Salvador Dalí, created works including The Persistence of Memory, The Hour of Monarchy, The Colossus of Rhodes, Untitled (Landscape with Butterflies) and the frontispiece for “La Limite,” all of which provided inspiration for Megan McKeithan’s mural entitled The Persistence of Dalí. Imagery including butterflies with Dalí’s eyes and blue lips, barn swallows, and stylized clouds provide a lovely backdrop for the three-dimensional melting clock reminiscent of Dalí’s most famous works. 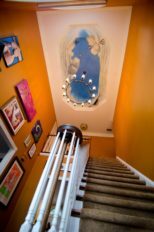 The mural creates an elegant Surrealist-inspired ceiling to top the salon themed foyer that houses the family’s growing collection of modern and contemporary art. 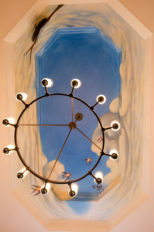 A butterfly also flies along the upper story wall, casting a shadow on the wall and mimicking many of Dali’s works. 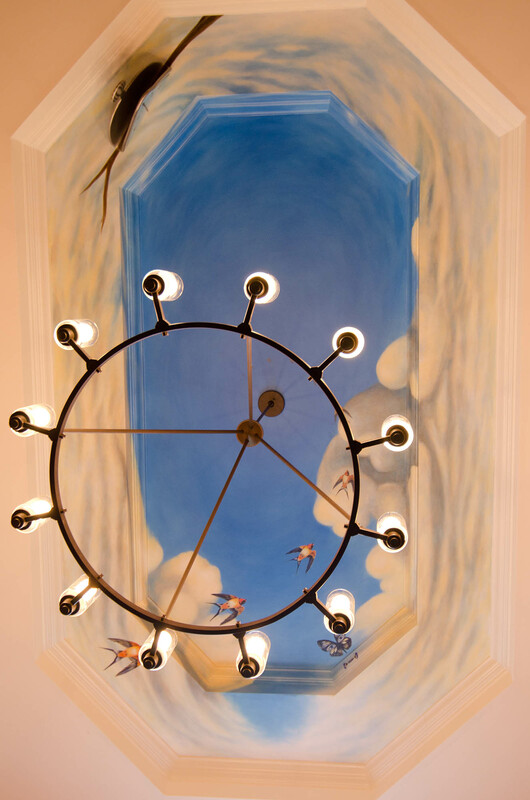 The foyer is adjacent to the piano room featuring Attente, a trompe l’oeil mural on canvas featuring the interior of the Paris Opera House. 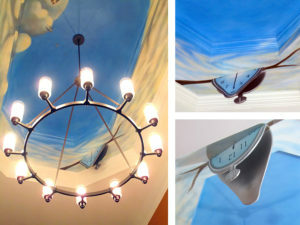 You can see the entrance to the piano room in the lower left of one of the overall shots of the mural. 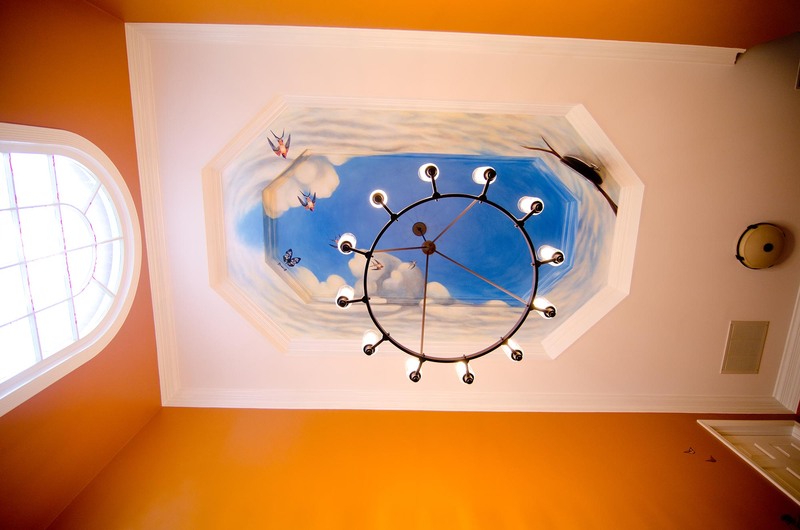 McKeithan also helped her clients design the look and color of the salon themed foyer that includes pieces by Dali and Chagall as well as contemporary artists and two of her client’s own pieces.